19 Years of experience in Laptop and Computer Repair. We offer great value repairs at competitive prices! We also stock many hard to find spares for laptops! Quick turnaround for repairs and servicing! If your are in even more of a rush we also offer a priority service! 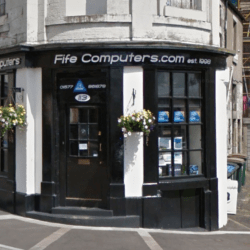 FIFE Computers are Kinross’ only computer retail store and repair company. We use cutting edge diagnostics hardware and software to repair any computer related problem. Happy Customers Approximately Each Year! Cups of Tea Drunk Each Year! Just a quick note to express my appreciation for the superb job which you carried out on the MacBook Pro and the iPad. I am absolutely delighted with the performance of the Pro, as it opens up quickly and my Excel files in rapid time. (unlike previously) Also feel more confident as to the security of the machine now you have put Norton on, even though the general view appears to be that Apples are ok. Great professional and friendly service. Thanks.